I never get tired of calling out the mainstream media. Its reporters give us steeply slanted stories and we’re supposed to believe they are fair and objective. A recent AP piece–not marked by Yahoo! 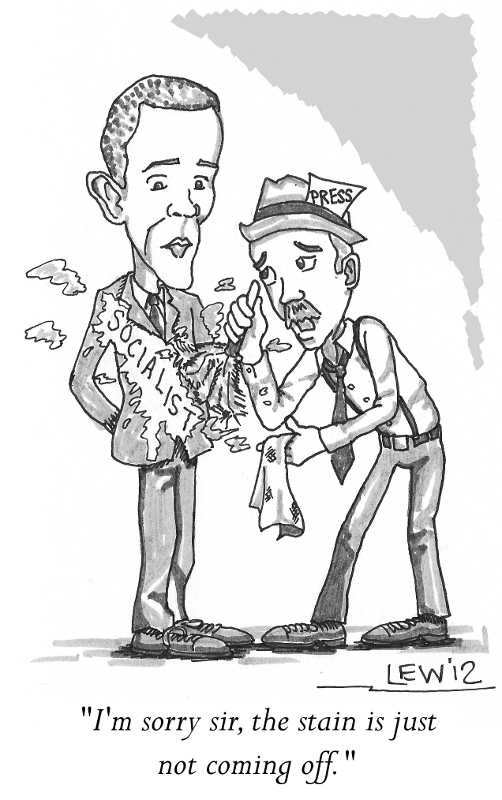 as commentary or analysis–defends President Obama against the “socialist” label while simultaneously slapping down conservatives. The article’s language allows the writer to circuitously vent his disdain for Obama critics. In his prose, they “pounce,” “slur,” and “denigrate.” Other words color the tone for us: contention, epithet, shock value, nonsense, insult. He weaves quotes from academic experts. One proclaims he is “weary” of the socialist label. Another points to a “hysterical outbreak of abuse” and “animosity” coming from a “certain segment of Americans.” In other words, racist bigots are saying bad things about the President. Besides saturating his article with inflammatory language, the writer gets smarmy by informing the reader that it was a socialist who wrote the Pledge of Allegiance. He faults Obama critics for missing a strict definition of socialism, but goes on to quote and mention people who do not fit the bill he uses. As written, this purported news story is just a string of unsubstantiated quotes and couched words meant to take conservatives down a notch. But this patronizing corrective is not the first. I remember NPR running a piece like this just prior to election day 2008. For years now mainstream journalists have been meticulously removing criticism from the President as if they were remora eels attached to the belly of a giant, lumbering whale. Hopefully a one-term whale. These nominally non-ideological reporters work in tandem with analysts and commentators who are open about their Left/liberal leanings. E.J. Dionne is among the more effective of this clean-up crew. Whether in his weekly sparring with David Brooks or on the talk radio circuit promoting his new book, Dionne often comes across as sharp, earnest, and even magnanimous. For many in the political middle that could be swayed, his style threatens to give credence to his thesis that conservatives have moved radically rightward, abandoning what he calls a traditional balance between private and public, individual and community. Never mind that he conflates government with community or that families, churches, and civic associations don’t neatly fit into his talking points. For some swing voters, tone and presentation will matter more than substance. Anyone who wants to stave off the misfortune of another four years of Barack Obama and his liberal, Leftist, progressive, and Democratic friends should consider carefully how they’re talking about him. “Socialist” may be a cogent term that energizes the base, but it will turn off at least a few independents who are paying attention. What I’m suggesting is not the abandonment of principle but getting fancy with footwork. In conversations that count, identify the common ground and frame the choice in those terms: personal responsibility, the dangers of centralization, or whatever it may be. Make it clear that even if Obama and Democrats don’t satisfy some strict definition of “socialist,” it is a distinction without a difference. We don’t need to renounce our partisanship like mainstream journalists do; it’s better to confess rather than suppress your bias. But beyond the statistics, labels, and gotchas that get thrown about, we must connect the dots, clearly articulating why it is we believe what we believe. The problem with the word “socialist” is that it is used to describe a variety of political positions, all of which may have something in common — DO have something in common — but which are distinct nonetheless. There still exist old-fashioned socialists who believe in the more-or-less complete socialization — state-ization — of almost all of the economy. Some of these people believe that such a transformation cannot come about without violent revolution; others see it happening peacefully (and within the latter category, some see it happening incrementally, others not). Then there are the European Social Democrats of old, who certainly wanted the nationalization of the “commanding heights” of industry, very high taxation on incomes so as to achieve wealth redistribution, and socialization of as many human concerns — such as healthcare — as possible. These people have retreated a long way from their original views, impelled by economic realities. Even the Swedes were forced to admit market forces to a number of areas they had tried to socialize completely. (They have a freer education system than the Americans.) They no longer want explicitly to kill the capitalist goose that lays the eggs on which their welfare state has been built. Since explicit socialism is no longer a conscious goal of these people, does it make sense to still call them socialists? It’s not a dirty word in Europe, the way it is in America, and they don’t generally mind being called “socialists,” since the word in Europe has come to be associated with (grudging) acceptance of the (regulated and taxed) market, which is a long way from the original ideal and goal of socialism. But “socialist” in the US still carries the sense of someone who wants an economy completely owned by the state. Is this Obama’s clandestine goal? I doubt it. Rather, Obama is, as Charles Krauthammer said, not a “socialist” in any meaningful sense of the word, but rather our first “post-American” President: someone who wants to make the US like Europe, or, more specifically, like the Europe that the European Social Democrats would like to see. We can argue about whether this is desirable, or even possible — would Swedish levels of welfare turn Chicago public housing residents into hard-working Swedes? — and that’s the sort of argument we should be having, not a semantic argument about the extent of Obama’s “socialism”. As the Cogitating Duck has said, an important part of our political task in the next period is winning over independents. The more we sound like paranoid conspiracy theorists == and let’s face it, there ARE some paranoid conspiracy theorists on the Right — , the harder that will be. Pingback: Bookworm Room » Conservative academics — they do exist!